I am glad to announce my first biomimicry publication in the journal Energy and Buildings and would like to give a short overview of it. The paper is titled “Solar Heat Harvesting and Transparent Insulation in Textile Architecture Inspired by Polar Bear Fur” and summarizes the main findings of my master’s thesis that I finalized in 2012. I was a biomimetics student at the Carinthia University of Applied Sciences in Austria during that time but did the experimental part of the thesis within an internship at the Institute of Textile Technology and Process Engineering in Denkendorf (ITV Denkendorf), Germany. The research focus of the paper is on the optimization of a textile-based solar collector system that could build the envelope of future textile-based buildings. Conventional solar collectors are usually built from heavy, rigid materials but alternative materials such as textiles allow for lightweight and material efficient solar collector system design. The proposed collector was inspired by the heat harvesting mechanism of polar bear fur. The polar bear is known for its efficient heat trapping properties, enabled by a dense fur of transparent and hollow hair that lets light pass through to the bear’s skin. The skin of the polar bear is black and absorbs light passing though the transparent fur. The emitted heat is trapped close to the bear’s body, due to a dense underfur including several air cavities for insulation. These principles were adapted to create a multi-layer arrangement of technical textiles and foils. Two transparent ETFE-membranes were used as the upper layers of the system. ETFE is known for its insulating properties but also lets light pass through due to its transparency. Underneath the ETFE-membranes a 1 cm thick air-permeable spacer fabrics textile provides space for an air-buffer. Underneath the spacer fabrics layer a black silicon layer analogous to the polar bear’s skin absorbs the majority of the incoming light. The emitted heat is trapped inside the system due to the air-buffer within the spacer fabrics layer as well as the heat insulating material properties of ETFE. Underneath the black silicon absorber an additional layer of insulation foam minimizes heat loss to the environment. For the purpose of heat transfer, an air flow was generated by a fan inside the air-permeable spacer fabrics layer. The air inside this layer heats up while it moves along the collector and can be piped to a thermo-chemical energy storage system for long-term retention of thermal energy. This concept could inform new self-sufficient, textile-based buildings that harvest all of their energy during summer months and spend this energy during winter. The ITV Denkendorf built a successful prototype building based on the principles described. The main goal of the study was to test different parameter changes such as air-flow velocities, irradiation intensities and material arrangements on the output temperature of the collector. Temperatures up to 150 C° could be generated using the proposed system. It was also shown that the proposed system is totally independent from ambient temperatures and would work even in sub-zero temperatures if direct solar radiation is available. In the paper, I also discuss further biomimetic strategies that could be considered for additional energetic optimization such as the trapping and guiding of diffuse light via optical fibers or antireflective surface coatings inspired by the moth-eye effect, for example. If you are interested in learning more you can access my paper on ScienceDirect. There are evolutionary advantages to living in a social group. Groups cooperate to hunt large prey, rear young, and defend territory. Group members experience reduced exposure to predation (safety in numbers), easier access to reproductive partners, and a rich learning environment. There are also evolutionary disadvantages to living in a social group, including increased exposure to disease and parasites…one would think. However, ecologists are learning this might not be a true in all cases. Getting a paper published isn’t easy, so when you succeed it’s one of those days that you’re fulfilled being a PhD student. You hope more of those days will come. This paper, freely accessible on Biology Open’s website, has been a long effort. For the biology-centered journals the paper was too technical, and for the more engineering ones it was too biological. Not wanting to admit this might be a problem particular to this paper, I think it might be a general challenge for Biomimicry-focused research. The goal isn’t necessarily to answer a very in-depth biological question, nor to engineer an entirely new system, but rather to understand biological strategies well enough that they can inspire new designs. I believe with the growing Biomimicry community, there either needs to be a broadened focus of current journals or the formation of new, biomimicry-centered journals that realize the interdisciplinary nature of biomimicry research. 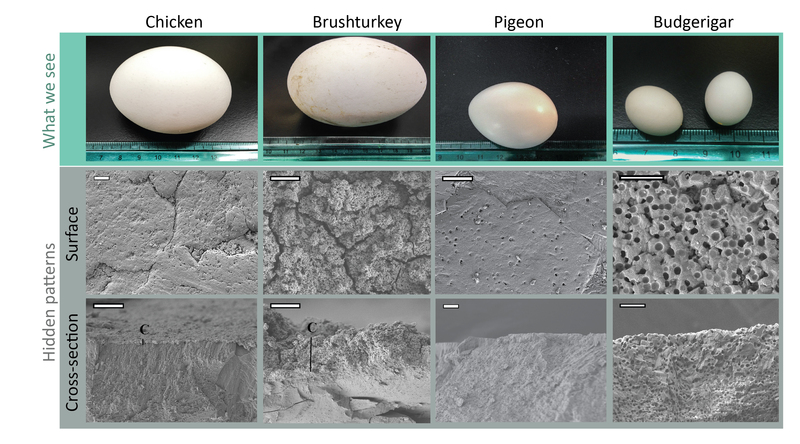 For the study titled “The cuticle modulates ultraviolet reflectance of avian eggshells” hidden patterns of eggshells were visualized with a scanning electron microscope (SEM) and UV reflectance was measured before and after etching the cuticle, the outer most layer present on some eggshells. 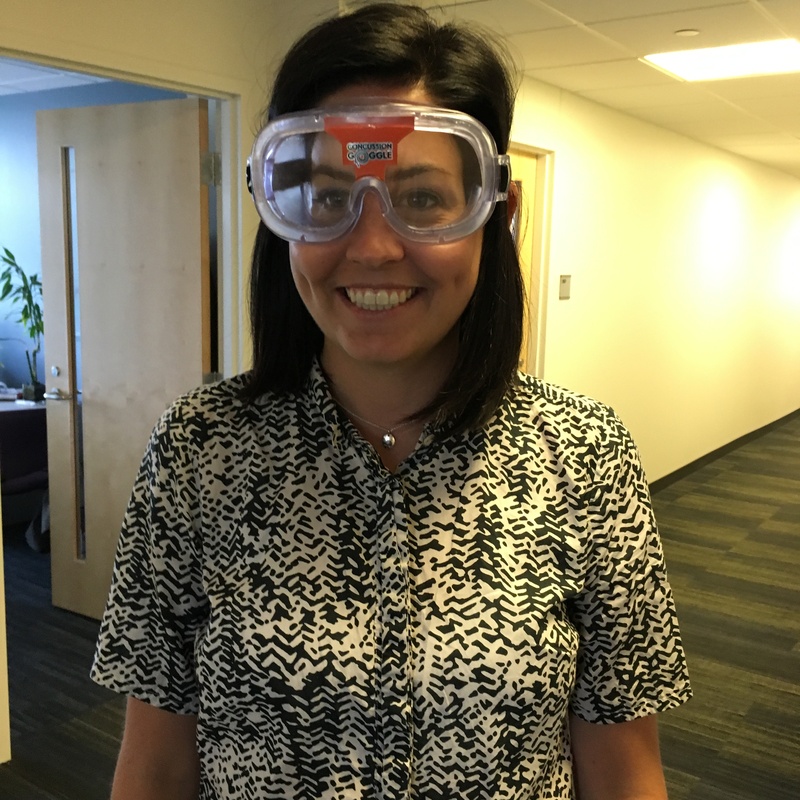 What triggered this research was the observation that some eggshells have very high UV reflectance, and the interest in how this could lead to new UV-protective materials. The high energy of UV radiation hurts; we’ve all suffered from sunburn after a sunny, summer day. Many materials, including our skin, are UV-sensitive and need to be protected from high sun exposure. This is also true for avian eggshells, as the developing embryo can be damaged by UV light. It has been speculated that the colours of eggshells can act as a sun barrier because the pigments can absorb UV light. But what about white eggshells that lack pigmentation? This study shows that the cuticle absorbs UV light. This outer layer has a different chemical composition than the rest of the eggshell, and includes proteins and calcium phosphates that can selectively absorb UV light. Eggshells are a great model system for inspiring innovative materials, because they are almost entirely made of calcium carbonate, a material that is totally harmless and naturally available in abundance. Next time you eat an egg, you might look at it differently. The Dieline is a packaging design website that promotes packaging innovations and serves as a forum where packaging designers can discuss trends in the field. Last week an article was posted to the site, titled “The Future Of Packaging: From Brand Design To Biomimicry.” The article discussed a vision of what packaging might be 100 years from now; a vision that, among other things, forecasted widespread use of biomimetic, biodegradable membranes for packaging. Looks like Mr. Limpet did it again. This time with structural color! A research article published in Nature Communications last week found the first biological photonic structure constructed purely of minerals in the limpet. After a long journey, we are finally able to share a preprint manuscript of our article “Biomimicry: A Path to Sustainable Innovation*,” which has been accepted for publication in Design Issues, an MIT Press Journal. Co-authors Emily Kennedy, Bill Hsiung, Peter Niewiarowski, Matthew Kolodziej and I have diverse backgrounds, including biochemistry, international relations, biology, and fine arts. The purpose of this paper is to introduce scholars, students, and professionals in all fields of design to biomimicry and its potential to yield sustainable outcomes when practiced in a deep, thoughtful way. The design community is an important leverage point for fueling dialogue about biomimicry because designers work “at the nexus of values, attitudes, needs, and actions,” and, therefore, are uniquely positioned to act as transdisciplinary integrators and facilitators. We hope you enjoy the reading, and that it sparks some discussion points that will further improve and stimulate the development of biomimicry. It is important to keep disseminating the biomimicry approach in new fields, and shed light on how we, together as a team of advocates for biomimicry, can stimulate newcomers to be more environmentally and socially responsible while still being innovative and not having to reduce your standard of living.